University of Phoenix recently presented full-tuition scholarships to three women during the Hispanic Foundation of Silicon Valley 27th Annual Ball. The recipients were selected for demonstrating the desire to help improve their communities by advancing their education. This is the second year University of Phoenix has partnered with the Hispanic Foundation to award scholarships to further the education of Latino professionals. "The Hispanic Foundation's partnership with University of Phoenix is important in our mission to promote educational achievement and increase the number of Latinos working in business, technology and science fields," said Ron Gonzales, president and CEO of the Hispanic Foundation of Silicon Valley. "The University's commitment to this goal is evident in providing scholarship opportunities to three working professional Latinas to continue their education." Karina Deras is planning to pursue a Master of Business Administration from University of Phoenix. She currently works in human resources and is planning to expand on her experience in the field and learn human resources strategies and best practices. She earned her bachelor's degree from San Jose State University. After graduating she co-founded the San Jose State University Latino Alumni Network to create a community of professionals to encourage each other's professional and personal growth. Martha Leticia Perez will apply her scholarship from University of Phoenix toward a Master of Business Administration with a concentration in healthcare management. She is interested in increasing healthcare awareness to non-English speaking residents through San Mateo County. Her experience includes working with the elderly and disabled in healthcare settings. She is also a volunteer for Health Insurance Counseling and Advocacy Program working to help provide resources to Medicare beneficiaries. Maria Rodriguez spent 35 years working in corporate America and became a top executive at one of the major Spanish television networks. Upon retiring, she decided to pursue a second career to help address mental health issues, especially among women. The scholarship she received from University of Phoenix will allow her to earn a bachelor's in psychology. "University of Phoenix's partnership with the Hispanic Foundation demonstrates its commitment to diversity and cross-cultural outreach in providing working adults the opportunity to enhance their careers and pursue higher education," said Angie Williams, Ed.D., dean of multicultural affairs and diversity at University of Phoenix. "We provided scholarships to three individuals who have distinguished accomplishments and will be able to apply what they learn to enhance their professional opportunities and contribute to the betterment of their communities." Throughout its history, University of Phoenix has exceeded national averages 1 for minority access. Roughly 45 percent of University of Phoenix students are people of color in addition to 34 percent of its instructors 2 — accurately reflecting the multicultural fabric of American society. Most of the University's students are working adults over 30 years old, and first-generation college students comprised more than half of the student body in 2014. Additionally, 76 percent of the University's students are working, including 57 percent women and 67 percent with dependents, which further emphasizes the demand by "nontraditional" students to enhance their career opportunities through flexible academic programs. For more information about University of Phoenix programs, including on-time completion rates, the median debt incurred by students who completed the program and more, visit www.phoenix.edu/programs/gainful-employment. 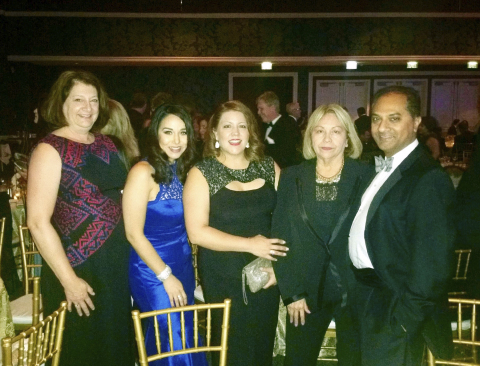 The Hispanic Foundation Ball, which was first held in 1990 to raise awareness about issues affecting the Latino community, promotes volunteerism, celebrates philanthropic leaders, and provides the funding vehicle to support nonprofit organizations serving the Hispanic community with cash grants. Over the course of its history, the event has become a powerful tool for building and channeling community philanthropy. The Hispanic Foundation of Silicon Valley has a long history of engagement with Silicon Valley's Latino community and continues its strong ties in developing the community's capacity to lead. Through the Hispanic Foundation Ball and other philanthropic programs, the Foundation has invested over $3.5 million in charitable resources in the success of Silicon Valley's Latino community. For more information, visit www.hfsv.org .